(Medical Xpress) -- College and cramming  often wheres theres one, the other is not far behind. That said, however, it has been recognized since the late 1800s that repeated periodic exposure to the same material leads to better retention than does a single en masse session. Nevertheless, the phenomenons neurobiological processes have remained poorly understood, although activity-dependent synaptic plasticity  notably long-term potentiation (LTP) of glutamatergic transmission  is believed to enable rapid storage of new information. Recently, researchers at the University of California in Irvine and the Scripps Research Institute in Jupiter, Florida determined that hippocampal activity can enhance LTP through theta burst stimulation (TBS)  but only when the affected synapses receive, after a long delay, a secondary TBS. 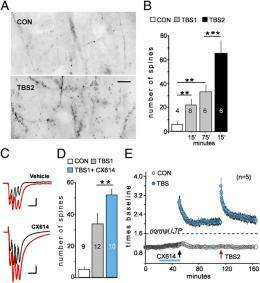 The researchers describe mechanisms that maximize synaptic changes that optimally encode new memory by requiring long delays learning-related TBS activity. The teams study aimed to fill this knowledge gap: They hypothesized that individual synapses have properties that affect a neural networks ability to encode and store new information, and that these properties would be relevant to what we already know about how humans learn best. One such example is spaced versus mass training. Its clear to anyone who has gone to school that that repetition of information and concepts results in better retention of information, Rumbaugh illustrates. This is especially true if the time between repetitions is on the order of days  that is, spaced training. In contrast, the same overall time spent with the information in one bulk cramming session, or mass training, results in poor understanding and retention compared to spaced intervals. This is why school systems are set up to teach multiple subjects in parallel, with each subject session separated by at least one day, instead of teaching each subject in a massed, linear fashion  for example, 20 days of physics, followed by 20 days of calculus, and so on. This ability to combine circuit structure and function allowed the researchers to understand which synapses were potentiated by each round of similar stimulations, and then assess how timing impacted both aspects of information storage. Specifically, Rumbaugh explains, we were able to induce information storage  LTP1  by electrical stimulation and then specifically label the synapses in the circuit that encoded the enhanced transmission arising from the original round of stimulation. When we reactivated the circuit, after waiting at least one hour, we greatly increased information storage in the circuit  LTP2  as measured in our electrical recordings. Using the imaging methods mentioned above, the team then found that LTP2 induced changes in synapses neighboring the synapses that originally stored LTP1. Therefore, they reasoned, a key feature of learning, spaced training, appears to be a result of properties that exist at individual synapses  so properties of synapses can affect the way networks encode and store information. This finding has real implications for persons with learning disabilities, Rumbaugh points out, since these features are of greatest benefit to understanding how learning disabilities arise  especially in neurodevelopmental disorders such as Intellectual Disability, or ID, which was formerly called Mental Retardation. Weve realized over the past few years that a common feature of ID is dysfunction of synaptic plasticity in which the neural basis of information encoding is disrupted. Now that the team has found that individual synapses govern the efficacy of learning at the network level, theyre confident that they can hypothesize that ID arises from a disruption in still-unknown synaptic processes that govern spaced learning. Stated another way, they would target this putative broken molecular process with a drug-like chemical compound capable of restoring the normal timing rules of spaced plasticity in a network preparation. If successful, the ultimate goal would be to test the idea that learning disabled patients would improve after application of this hypothetical compound. Except it is starkly different for me and 2 other people I know. This is true because we were able to fully grasp the whole of the idea (ie a whole unit in school) as opposed to learning snip its and trying to piece them together. This study is too general it needs to take into account peoples normal retention because every brain retains information at different rates. If I can read it once and not lose any of the information then how could spaced training be anything other than a waste of time? Uh I think you lost the fact that mars is smaller than earth. Better learn that one again richie.